Pleated blinds offer a softer approach to window shading and are typically suited to conservatory or special feature applications such as roof blind. A complete spectrum of designs and colourways, including technical fabrics for all domestic and commercial applications are available. 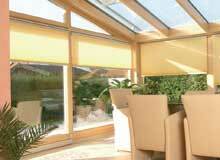 Most fabrics offer a UV reflective coating on the back to help keep your conservatory as cool as possible in summer. Duette blinds sometimes refered to as cellular or honeycomb blinds are essentially two or more pleated blinds back to back so that they form a honeycomb. 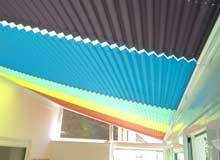 This is beneficial as it helps to retain heat better than most other blinds. Also due to the cellular effect of the fabric the lift cords that are visible on a pleated blind are hidden as they run through the fabric. 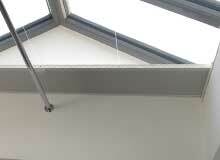 Utilising Somfy's Wirefree tilt and lift 25 RTS motor free hanging blinds can be made up to 2400mm wide and 4000mm drop. The wirefree motors feature Somfy's MY position and can be powered with either standard battery packs or rechargable packs. Using Somfy's LV25 and LW25 motors this is a wired motor that requires an external transformer to supply power to the blinds. 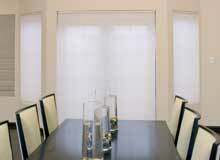 Blinds are available up to 2.3m wide and 4m drop. Utilising Somfy's Wirefree tilt and lift 25 RTS motor skylight roof blinds can be made up to 2300mm wide and 4000mm drop with a maximum area of 6sqm.